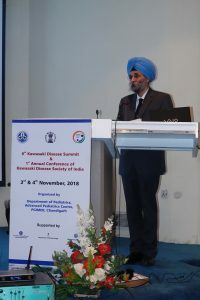 The 6th Kawasaki Disease Summit of India and the First Annual Conference of the Kawasaki Disease Society of India took place in early November 2018 in beautiful Chandigarh, India and was hosted by Dr. Singh and Dr. Vignesh. 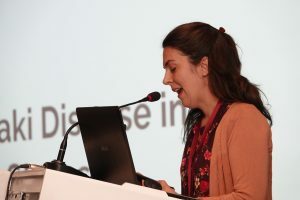 Doctors from around the world were there in attendance to educate fellow doctors, interns, and parents on new and current research and theories surrounding Kawasaki disease. 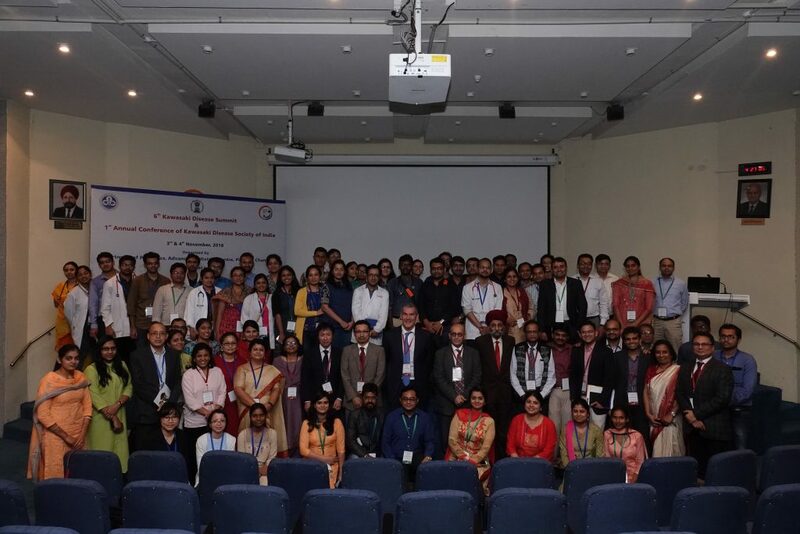 The symposium took place over two days and was an intensive schedule of back to back presentations and interviews featuring doctors from Germany, France, India, and Japan. It was my pleasure to be able to represent the KD Foundation and the United States at this event. My job was to present current American studies and statistics as pertaining to misdiagnosis here in the states. My presentation was also a personal one. My son Levi was diagnosed with Kawasaki disease once in 2011 and again in 2015. The first time he fell ill he was misdiagnosed several times and ended up in the Pediatric Intensive Care Unit in critical condition. As a parent of a survivor, it was important to appeal to current and future KD doctors of the world to not take KD or parent intuition lightly, quick diagnosis is important, complicated and often in their competent hands. After my presentation, I was taken to a smaller room where the hosts had arranged for the parents of survivors to talk. People were translating but it was hardly necessary as most people there were bilingual and conversation flowed very smoothly. I was seated next to several men and women. The woman on my left was the mother of a child who had suffered heart damage, she and her husband are still navigating the complex world of KD aftermath while also looking for ways they can help make a difference for others. The woman on my right was the mother of one of the first cases of KD ever diagnosed in India. She has since dedicated her life to helping people receive free and timely treatments of IVIG for KD. The room was full of parents, grandparents and children. They took turns asking questions. There was a lot of curiosity in how we handle KD here in the States and about the KD Foundation. When Dr. Singh entered the room the entire air about the place shifted. People began standing to bow, nod or offer their chair to him. He is wise and distinguished looking with grey hair and joyful eyes. He sat next to me, and once he settled in, the questions began again. Every now and then in the discussion, he would speak out. 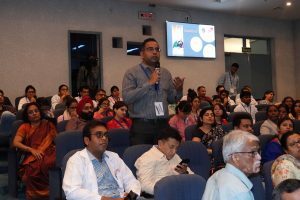 One of the things he was stressing to the parents the most was the need for parent support in educating doctors and spreading the word about KD in India. He encouraged the parents in the room to form groups and get organized similarly to what the KD Foundation has done in the States. One woman in the front row of the audience said she felt defeated, that the doctors do not listen to parents because of their status. I felt I had some insight to give on this matter from my own personal rejections. I told her that we often deal with the same obstacles in the States and it can seem daunting. But at the same time, no progress will ever be made unless action is taken. The KD Foundation and many parent advocates have accomplished great things in the years since my son was diagnosed. She nodded and understood my argument. Dr. Singh spoke with the parents patiently. I can see why he is so beloved. Not only is he accessible to his people but he has a genuine love for children. He reminds me of our own revered Dr. Burns in that regard. Dr. Singh is also a teaching doctor who is mentoring future KD specialists and researchers, ensuring that his reach will go far beyond his lifetime. His students acted as hosts to all of the symposium’s speakers. They served as tour guides and translators too! My guides/medical students for the week were: Vibhu, Rashimi and Kanika. Vibhu is studying to be a KD doctor herself! The three of them took my father and I all around Chandigarh, which is one of the most beautiful cities in India. In the afternoons our hosts were busy working on the symposium organization. 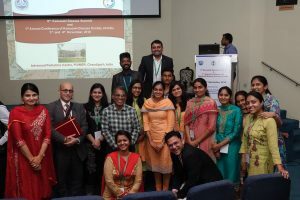 Being there in India, under the care of Dr. Singh, Dr. Vignesh and their students was one of the most welcoming experiences of my life. Two things became very clear during the symposium that I want to share with you all. One, even though we are on the other side of the world from KD parents in India, our experience is the same. We face the same obstacles and challenges. We are ready for the battle that we didn’t ask for. I spoke to many parents that day who’s stories mirrored our own, almost word for word. We share a common human experience, and because of that, we are more similar than different. The second thing is how lucky we are to have a group like the KD Foundation here in the states. Parent organized advocacy makes a difference and is very, very necessary. Whether we see the fruit of our labor or not, we are helping the overall cause just by advocating, donating and educating!